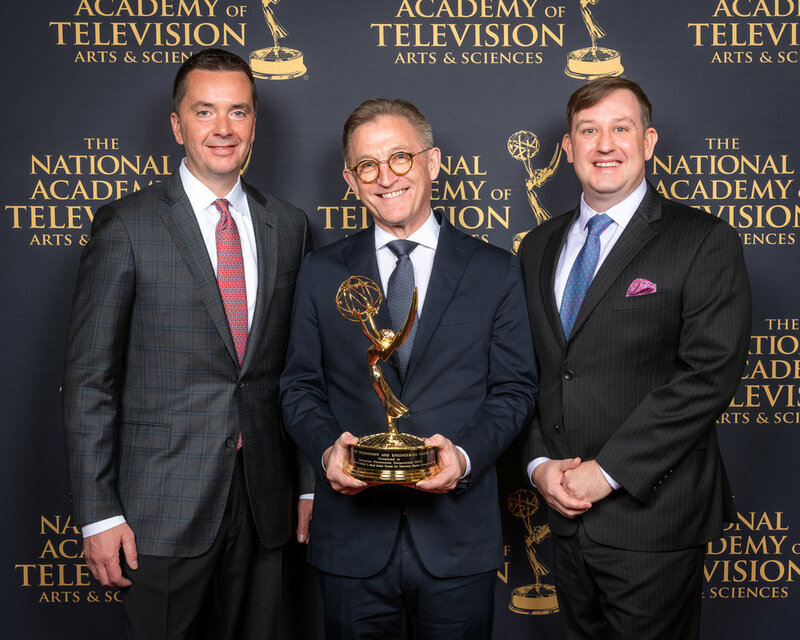 ESS Weathertech (ESS) are proud to announce that our partner radar company Enterprise Electronics Corporation (EEC) in the United States have been presented with an industry recognised Emmy® award (at The National Academy of Arts & Sciences ceremony) in the field of Technology and Engineering. We would like to formally congratulate our Director (and Chairman of EEC and ESS), Colin Cookes, who accepted the award alongside EEC’s President and CEO Chris Goode and Director of Strategic Business Development Richard Stedronsky and everyone’s involvement at EEC in this achievement. EEC are world leaders in meteorological radar technology and have been operational since 1971. Consistently pushing innovative boundaries in weather radar has landed EEC with this well-deserved award for revolutionising the first, mobile, X-Band radar. The StormRanger is a doppler weather radar truck that is designed to forecast weather for television and reporting purposes. Meteorologists and journalists therefore have the data and knowledge for real-time monitoring at their fingertips, increasing the accuracy and speed of forecasts. American broadcasting stations NBC and Telemundo both own StormRanger trucks and were involved in the process of developing the system so EEC could deliver a product to complement the requirements of the operational staff, by fitting a Ranger® X-Band radar customised to their vehicles. EEC’s Ranger® X-Bands are dual-polarised weather radars, with a compact, light-weight design, solid state transmitter and low power consumption - making them perfect to be fitted to mobile systems. The dual polarisation capability offers very high-resolution data obtained from signals for short and medium range weather detection. This detailed information has the ability to tell us more than ever about the atmosphere, not limited to accurate estimates of events such as rain, thunderstorms and hail, but discriminating between particles to even detect smoke, enhancing emergency service response. EEC are responsible for industry advancements in the area of dual-polarised radars making them pioneers in the field. ESS Weathertech have delivered mobile X-Band radars for the Indonesian Air Force in 2015. For more information on Ranger® X-Band radars, please visit: http://www.eecweathertech.com/ranger-x-band-radar-systems.php or contact us at sales@essweather.com regarding inquiries. ESS Director and EEC Chairman Colin Cookes (centre), EEC President & CEO Chris Goode (left) and EEC Director of Strategic Business Development Richard Stedronsky (right). Posted on April 10, 2019 by Tim Cookes and tagged meteorology EEC radar X-Band Emmy. Fires are capable of producing their own localised weather including fire clouds and tornadoes - with the first fire tornado in the world spotted in Canberra. Sunscreen should be worn all year round! UV rays are weaker in winter, but can still be strong enough to cause harm.